An exciting day 11 is in the books, let's recap the three matches. Belgium came into this match three points away from qualification to the round of 16, while Capello's Russia were looking for crucial points to preserve their chances of staying in the competition after their 1-1 draw with the Koreans in their first match. After being the difference makers off the bench in the match against Algeria, both Marouane Fellaini and Dries Mertens were included in the Belgian starting eleven against the Russians (the only nation in this year's World Cup consisting solely of players from the country's domestic league). The Belgians started very well, enjoying most of the possession in the first 20 minutes. The Red Devils impressed with their early passing display, and Mertens was a constant threat on the right flank, with Russian left-back Dmitri Kombarov unable to contain the Belgian on most occasions. But against the run of play the real scoring chance came from a good shot by the Russian; Thibaut Courtois was up to the task with a good save. Unlike the Russians, the Belgians looked full of confidence in the first twenty five minutes or so. In the 25th minute however, it was another chance for the Russians as Maksim Kanunnikov entered the Belgian box with the ball and seemed to have been fouled by Toby Alderweireld with a slight kick to the leg which was on top of the ball at the time. The ref did not blow for a penalty-kick however, and the match went on. In the 31st minute a big blow for the Belgians as Thomas Vermaelen had to be substituted due to an earlier knock picked up in the pre-match warm ups. Mertens continued to put the scare into the Russian defense and had another great chance to score after picking up a pass in the box and putting a shot on goal. Akinfeev looked much more confident than in his first match of this tournament and made a good save. Just before the half-time whistle Russia's best scoring chance of the game saw Aleksandr Kokorin miss an almost point-blank header just wide of the goal after a good cross into the Belgian box. The second half started a bit slow. With both squads looking a bit sloppy in the the first 10 minutes. In the 57th, Romelu Lukaku who has been mostly invisible both in this and the previous match was subbed off for 19 years old Lille striker Divock Origi, who had only been capped on 3 previous accessions for his country and had not managed to score for them as of yet. With the match winding down it was starting to look as if Russia was content with 1 of 6 points as they switched to a more defensibly predominant style of play. In the 80th however, Russia yet again had a chance to go ahead as Andrey Yeshchenko received a comfortable ball inside the box, and with plenty of time and space to shoot he missed the goal completely, summing up Russia's lack of finishing power and World Cup faith altogether. 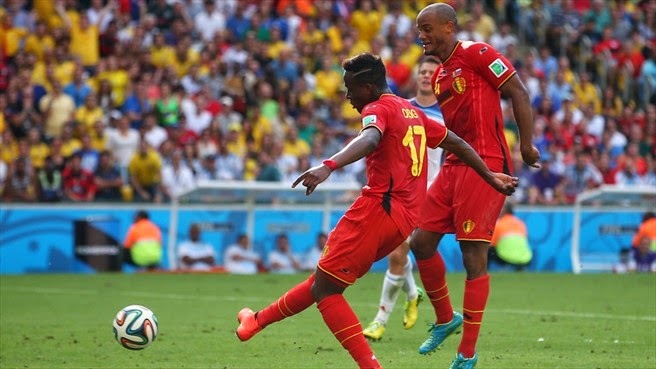 In the 87th minute, just after Kevin Mirallas put a free-kick onto the Russian post, and as the Russians still seemed to be trying to preserve the draw, Belgium's Hazard took the ball into the Russian box and after a few clever moves and a perfect pass to substitute Origi, Belgium was up 1-0. The 19 year old enjoying his first goal for his national team, and Belgium yet again was saved by a substitute seeing their third goal of the tournament scored yet again by a player who initially started the match on the bench. The match ended with a 1-0 final score. Game 28: Algeria 4-2 Korea Rep.
After the "not so exciting" Russia versus Belgium affair, World Cup viewers were treated to an exciting match between Algeria and Korea Republic. Algeria came out of the gates energized and looking the hungrier side to secure a victory over their Group H rivals. In just the 4th minute the Algerians had penalty-kick appeals that seemed legitimate, but the referee wanted nothing to do with an important early call. For the first 15 minutes of the match it was Algeria enjoying the majority of possession and Korea utilizing the counter-attack strategy. In the 26th minute the Algerians went 1-0 up with a very deserved goal. Carl Medjani put in a long high ball towards striker Islam Slimani, and Slimani made no mistake, controlling the ball well and putting it in the back of the net. You could feel the momentum Algeria has built up, and just two minutes later they were on the board yet again. A well curled corner-kick for the Algerians was met in the air by Rafik Halliche who got to it just before the Korean goalkeeper, and headed it into goal, 2-0 Algeria. Algeria would add one more before the final whistle, when Abdelmoumene Djabou received a good pass in the box from Slimani who scored Algeria's first, and just like that in the 38th minute the North Africans were enjoying what was starting to look like an embarrassing loss for the Koreans. In the second half however, the Koreans started well, putting on some early pressure on their rival's goal. And just 5 minutes from the re-start, the Asians would have their first as a long ball to Son Heung-min was controlled very well by the Beyer Leverkusen striker and after a turn with the ball, the Korean put it between the Algerian goalkeeper's legs. In the 60th minute the Koreans came close to making it even closer as a long shot from Sunderland man Ki Sung-yueng was acrobatically saved by the Algerian net-minder Raïs M'Bolhi. Two minutes after the Korean chance however, the Algerians (against the run of play) put together a great string of passes going up field, and a final "one-two" combination between Yacine Brahimi to Sofiane Feghouli gave Brahimi his first ever goal for the Algerian national team, and put Algeria in the record books as the first ever African nation to score four goals in a World Cup match. Korea would get one back in the 72nd, after yet another long ball into the box eventually made its way to captain Koo Ja-cheol who tapped it in to make it a 4-2 final. A match that promised to keep the Portuguese safe or perhaps send them to an early exit from the 2014 World Cup started off on a high for the Europeans. Cristiano Ronaldo showed off some silky smooth moves early on, taking the ball away from the three Americans marking him. But Portugal's goal in the 5th minute was less than spectacular. A ball into the American box landed directly at the feet of Nani after a terrible clearance attempt by Geoff Cameron. Nani did not make a mistake and gave his side a 1-0 lead early. But the Americas seemed to have the better of the chances after the opening goal of the match. In the 13th minute captain Clint Dempsey put the ball just slightly over the Portuguese bar with his free-kick attempt. And then another chance a few minutes later created by a through ball from Michael Bradley, Dempsey's shot on goal from a tight angle was saved by the Portuguese keeper. Just before the end of the half Portugal missed their chance of going up by two goals after Nani's long shot was mishandled by US keeper Tim Howard and hit the post; Eder was there for the rebound, but the off-balance Howard managed to make an impressive acrobatic save. The United States attacked from the beginning of the second half and in the 55th minute they had their best scoring chance to that point, when Michael Bradley received a pass-back in the box and calmly tapped in towards the empty goal. It did not got in however as Ricardo Costa was there to save his team with the goal-line clearance with his knee. But just eight minutes after that, a corner-kick delivery that was headed out of the box landed at the feet of Jermaine Jones, and with a smart touch to his right side he created space and curled a beautiful shot past helpless Portuguese keeper Beto, as he did not even move, just watching the ball go into the net. Two minutes later it looked like the Portuguese would retake the lead with a shot from inside the box, but Tim Howard was up to the task with a good save. The Americans kept pressing while Cristiano Ronaldo looked like he could not get anything right in this match with multiple failed attempts to penetrate the American defense. In the 83rd minute it was ecstasy for the Americans, as a messy situation in the box landed the ball at the feet of Graham Zusi who passed a perfect ball to Clint Dempsey, and the captain used his abdomen to tap the ball in to the empty net from short distance. It looked all but over for the Portuguese side who could not get the ball past the American barriers. 5 added minutes were to be played, but even in the added time the American defense looked too strong. In the last minute of added time however, when the match looked to be almost over and the Americans seemed to take their "foot of the pedal" Ronaldo received the ball on the right flank and put a perfect curled ball into the box. At the end of that pass was the head of Silvestre Varela who made it count and gave his squad a slight chance for qualification to the next round, when it seemed like the Portuguese will have none. A 2-2 final score keeps Portugal in the running. None of our guys got the correct scores today (let's face it though, aside from the Belgium match there aren't many peopl who would have predicted the score of the other two fixtures correctly), but while Kon's only success on the day was predicting a win for Algeria, Pedro and Iain predicted the outcomes of two matches right. A tie for Iain and Pedro!